LONOKE — Early on, it looked like Carlisle would not be able to get things going against Lonoke. However, it was not a sign of things to come. The Lady Bison improved to 3-0 by overcoming a 7-0 and 19-12 deficit to beat the Lady Jackrabbits 46-36 on Thursday at the Gina Cox Center. Carlisle did not score until the 2:27 mark of the first quarter when Shelby Hancock hit 1 of 2 free throws. Carlisle’s Leigh Ann Wolfe followed with five in a row, and Carlisle trailed 11-6 after the first quarter. Lonoke (0-1) pushed its lead to 19-12 with 4:14 left in the first half following consecutive three-pointers by Dreya McClain and Olivia Dollinger. The Lady Bison scored the next seven points to tie the game at 19-19 at halftime. Josie Fortner started the run with two free throws. Wolfe then hit a three-pointer. Fortner and Heather Bowlan each hit a free throw to account for the first-half run. Carlisle scored the first four points of the second half — two each by DeShaye Ricks and Hancock, to take a 23-19 lead, a lead they would never surrender. Lonoke broke the 11-0 run when Kaley Woodruff scored with 5:51 left in the third quarter. Carlisle then went on a 14-4 run to lead 35-25 with 3:32 left in the quarter. Lonoke could not get any closer than six points the remainder of the game. Woodruff hit a three-pointer with 7:19 left to make the score 37-31. Carlisle then scored four in a row to lead 41-31. Carlisle coach Jonathan Buffalo was proud of his team’s ability to come back twice. Both teams struggled at the free throw line. Carlisle made 14 of 29 attempts; Lonoke made 6 of 19 attempts. “Any time you go out on the road against a bigger school, a good basketball team, and you come out with a win, you can’t be anything but happy,” Buffalo said. Lonoke coach Heath Swiney was proud of the way his team started the game. “In the first quarter, we did a really good job of executing of what we had seen on film in the past,” he said. “In any defense, there are some holes. We were getting some easy shots because we were going inside first then outside. Swiney also gave credit to the Lady Bison for being able to rally. “They just chipped away at it,” he said. “Both teams got in foul trouble. I thought Carlisle’s kids off the bench did a good job of doing thing well when they came in and had to. Hancock led all scorers with 12 points. Wolfe and Ricks had 10 points each. Fortner had seven. Bowlan added five. Kiara Miller scored two. Ricks and Taylor Cullum had eight rebounds each. 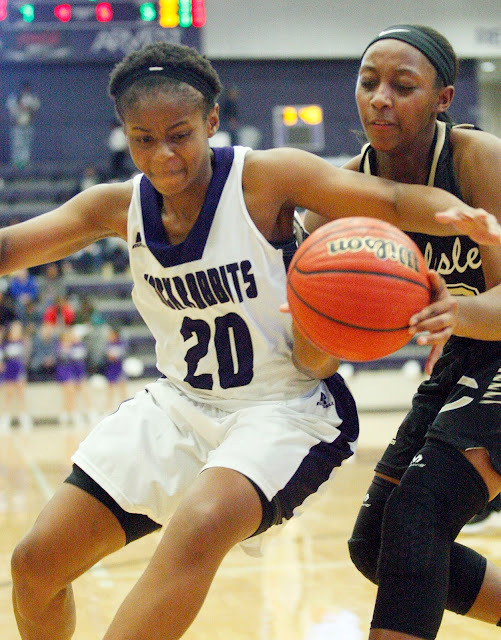 Woodruff and Kaleigh Thompson led Lonoke with eight points each. Hannah Moseley had seven points and seven rebounds. Dollinger had six points. McClain had five. Eva Richardson had two points.